The Ma-Hu Mansion was built in the late 30s on Tulsa's outskirts by a rich oilman and his wife. The massive iron "Ma-Hu" sign at the entrance to the house on the hill was eerily reminiscent of the gate to Charles Foster Kane's "Xanadu"; visitors were undoubtedly startled to see exotic animals on the grounds. 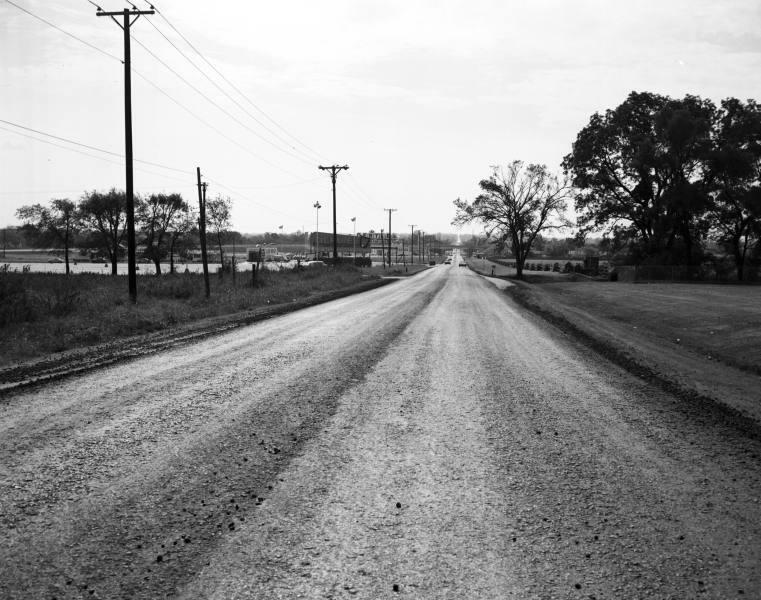 After the childless couple passed away circa 1970, a developer took over the property with the intention of building a commercial center, but it never came to fruition. 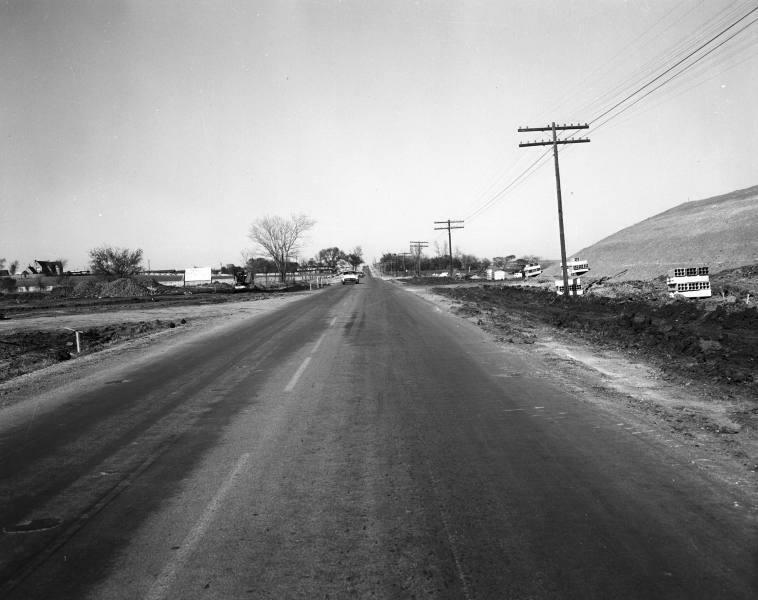 Looking south on Memorial: Oertle's, House of Name Brands (now Clear Channel) on the left, Ma-Hu Mansion (now Tracy Park II) on the right. I can vaguely remember this place from when I was very young. I thought that it was one of the most beautiful homes that I had ever seen. (Speaking only of the how the house looked and its situation on the grounds. I have never been in it). Anyway, I was, on night, browsing the Beryl Ford collection and came upon 2 pictures. #539 (above) showing Memorial Dr. looking south from about 25th Street. You can make out the beautiful property line and split-rail fencing just to your right near the top. You may note the entrance to the property at about the center right of the picture. It is the 2 large stacks of stones with stone like wall amongst a tree line. (Note the mailbox on Memorial just to the right of the road and south of the driveway). Remnants of the drive wall are still there to this day. Picture # 545 (below) looks north on Memorial from about 28th Street. You can see the Ma-Hu mansion in the left center of the picture. There is a park where much of the property's west end once was. During the spring and summer, if nobody picks them, flowers still grow where the home's foundation and gardens were. If you go into the neighborhood, off of 27th Street, you can see a double row of very tall trees that run from Memorial to the west and is on the north end of the property. This would be the long drive up to the house. Not to brag, but I was the person responsible for producing the first Scream in the Dark in 1972, located at the Ma-Hu Mansion. I was the Administrative Director for Campus Life, and responsible for coordinating all city-wide events. In previous years I was told that Scream in the Dark was held at various houses that had been targeted for demolition by the city. 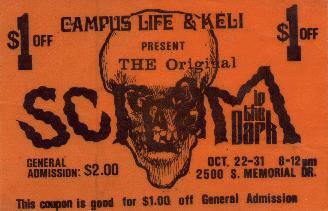 Usually 2,000 to 3,000 people attended the annual event, netting about $2,000 each year for Campus Life. When the 1972 Scream fell into my lap, I knew the perfect location: the Ma-Hu Mansion. By then the house was abandoned and in disrepair; it sat on a hill and with the moon above looked absolutely spooky; it had a long, winding, tree-lined stone driveway (great place for remote speakers and spooky stuff); it was on a major street (Memorial) with plenty of traffic for posting a large advertising sign; it sat across the street from Tulsa's largest discount store (Oertle's--long since gone) which had a huge parking lot; and it was located within a stone's throw of I-44 (convenient for the entire city). The site was just perfect. In 1972 the house was owned by a Kansas developer who gave us permission to use it, and we enlisted the support of the Tulsa JCs, and KELi radio station. Each Campus Life High School club was designed a room and staffed each show, the JCs helped us with all of the construction (electric and carpentry), and KELi helped us sell the event on the radio. I oversaw 200+ volunteers build and run the event. The house had about 9,000 sq. ft. of space, so we set up two routes. One the went through the basement and part of the first floor, but was less popular than the second route. The other went through the upper floors and ended on a slide through one of the second story windows that emptied the guest onto the lawn in the back yard. People stood up to an hour in line, and more than 26,000 visited us that first year. It cost us about $5,000 to build the Scream house, and we netted more than $25,000 for Campus Life. I left Campus Life and Tulsa in 1973, so I don't know what happened to the event in later years, though I understand the mansion burned in 1977 and then it was razed. When they tore down the mansion across Memorial from Oertle's, we had a reporter at 8 named Ken Reed. Ken's father was, I think, a brick mason, and had worked on the building of that mansion. He did a really nice story on the mansion and how whenever he passed it he always thought of "his old man". It was a very moving piece. I wish I had a copy of it. Mike Pierce was the cameraman and editor for this Ken Reed Ma-Hu piece. My grandfather, Frank Reed, built Ma-Hu to the best of my knowledge. My uncle, Ken Reed, now lives out of state, but it was quite interesting to see the film piece he did for KTUL. 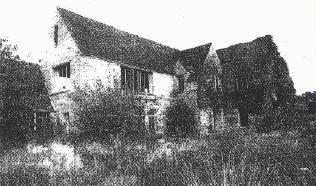 In 1978, after vandals and Scream in the Dark had taken its toll on the mansion, it was torn down. 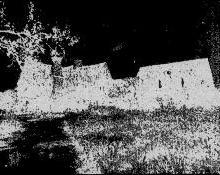 All that remained of the once proud estate was the massive wall, that I believe enclosed a huge stone barn behind the main house, and the long stone driveway that led up from Memorial Drive. Fortunately I was able to rescue some of the rock and use it for landscaping and on the front porch and entry of the house I used to live at in Tulsa until 2001. With permission, me and a friend of mine made several rock saving expeditions to Ma-Hu in the late 80s. We mostly took the rocks that capped the top of the wall but we also got them from the driveway, around the top of a well and from the curved entry steps on the south side of the wall. The cool thing is that we used the curved stones from the south entry on the front porch of my house. I used to imagine all the people that had walked on those steps over the years, especially during Ma-Hu's heyday. Anyone remember in the 70s a radio station had a treasure hunt and would give out clues on air to find it and people were digging up yards and graves looking for it? It ended up being at the Ma-Hu mansion across from Oertle's in the front by the rock fence. I did a lot of growing up in that mansion. My mother was practically raised there. I know its complete history as it was my family that built it. Many great stories of it and several pictures of it during its heyday. What a sad, sad end. My great grandmother was Hazel Queen-Campbell. Hazel Queen's sister was Mabel Queen-Hodges the wife of Hugh Blair Hodges. Hence "Ma-Hu". The Queen family of Perry, Noble Co. has an amazing history particular to Oklahoma just before statehood. Mabel & Hazel's dad (my great, great grandfather) was John Bruff Queen who was the premier auctioneer for the territory just before Oklahoma became a state. He in fact auctioned off the entire town site of Anadarko. He also bought and traded horses for the military, Ringling Bros. Circus & Buffalo Bill's Wild West Show. He was personal friends with Pawnee Bill and several Indian chiefs including Chief Bull Thunder (ref. the Hennessey, Ok. Massacre). Chief Bull Thunder gave him a complete ceremonial head dress. John Queen's extensive Indian relics collection was the largest that was privately owned and it was always displayed in the basement of Ma-Hu. That is just the tip of the iceberg on that fantastic house. I played my first trumpet recital in the front room that was occupied by "Uncle Hugh" after he suffered a stroke. That was in 1964. I was 10 years old. I remember the house like it was yesterday. I have some of its furnishings in my house today. More from Skip about Ma-Hu and another photo at Tulsa County. Does anyone by chance know where I can get or view a picture of the old Ma-Hu Mansion that was on Memorial about 26th street across from Oertle's? I was awestruck by it as a kid, and devastated when it was torn down. ...around Halloween, two lines of people wound all the way down the hill and for several blocks up and down Memorial. The house was actually divided into two different walk-throughs, each composed of many very sophisticated scenarios, and each taking quite sometime to navigate. ...there were always stories about people having heart attacks or breaking their legs. Needless to say my parents would never let me go..they don't have haunted houses like that anymore. The Mahu was another weird experience...for years I had driven by that place, curious at to what it looked like inside. In 1976, after the Mahu was abandoned, I went inside it one afternoon, all alone, and was completely stunned. The house was covered in graffiti, pentagrams, nasty stuff! What a shame. When it was occupied there were longhorn steer grazing on the estate. I recall as a student as Nathan Hale, that the "eco-warriors" of our day were protesting development of the land in our neighborhood and wanted it to remain in its natural state (whatever that was.) I don't recall their having any plan formulated for land stewardship in the unlikely event they won. They just had to be passionate about some cause. They needn't have worried, the whole deal fell through and the place sat vacant and was picked clean by various trespassers. The whole place was razed in the early 70's due to the fact that it was an "attractive nuisance." I was so glad to see the page about Ma-Hu Mansion! I grew up in Tulsa during the '70s and lived in a neighborhood S.W. of the Ma-Hu property. As a kid, my friends and I often played in and around the old house. I remember it being a rite of passage to simply walk through the basement and coming out alive! I was saddened to hear about its eventual demise but glad to have been around during that era and having great memories of the big old house that once sat up on the hill on Memorial Drive. 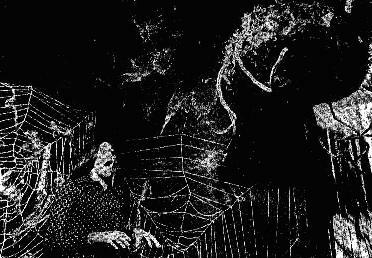 Stevo has samples on his site of the music used at "Scream In The Dark". 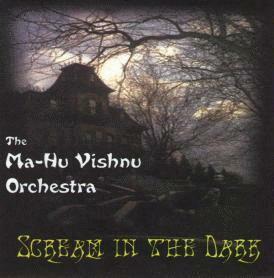 Here is a new CD of spooky music inspired by the Ma-Hu Mansion in "Scream-O-Phonic Stereo". This CD is as dam' fine as Agent Cooper's pie. I like to play with the sound system's ambience when this one is in the changer. If you plan some Halloween fun, this could be your soundtrack. David's flair for the fantastic is especially in evidence on this offering. Order information is on The Tulsa Project page. In 1999, I was walking around the ruins of old MA-HU and came upon a date inscribed in concrete reading: August 7, 1941. The mansion goes back to 1937 according to your information. I was with my two young nieces at the time. The next week I asked a female friend of mine to join me as she lived close by, but it turns out that developers had already dug up and removed the remains. Originally, I thought the inscription read 1944, but it was 1941. A really surreal twist to this "mystery" for the ages.